Performers include: Jay Leno, Edd Hall, Kevin Eubanks, Nina Bergman, Brandon Molale, Julie Scardina, and John Melendez. Having taken over from Johnny Carson, this late night talk and variety show is hosted by comedian Jay Leno. Following the basic format of its predecessors, each episode consists of the host’s opening monologue, a comedy routine, and interviews with notable celebrities. Various musical acts or stand-up comedians are also sometimes featured. Guests included Sheryl Crow, Carol Burnett, Oprah Winfrey, Kim Kardashian, Jack Black, Chris Paul, Billy Crystal, Jim Parsons, and Marc Shaiman. You can read more here. First aired: February 6, 2014. What do you think? Do you like The Tonight Show with Jay Leno TV series? Do you think it should have ended? The Jay Leno Show: What Happened on the Last Episode? The Tonight Show with Conan O’Brien: Cancelled, What’s Next for Conan? The Jay Leno Show: Has the TV Series Finally Been Cancelled? 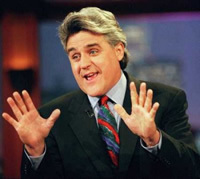 The Jay Leno Show: Big Premiere Ratings; Cancel or Keep It? He was the best there had been for a long time. He brought up current events with humor. The current late night shows the Jimmy Fallons and and the others shove their opinions on their audience. I don’t want their opinions, I don’t want their lectures – I just hoped I could be entertained. Not happening. So sad that the tonight show with the marvelous Jay Leno has stopped. Ne one can replace this wonderful artist.